What I'm trying to do is to label vertices of a polygon with a number and plot that number inside the polygon. So far I extracted the vertices to a 2nd point layer. Named them correctly and plotted them. I can't find an option to restrict their position to the inside of a polygon. Is there any possibility to do this? 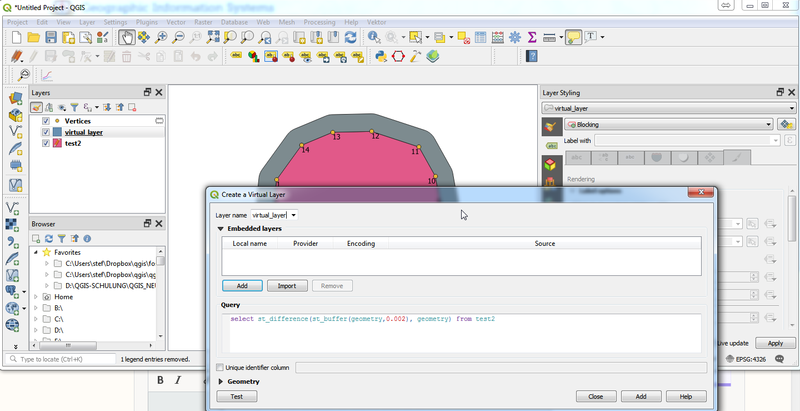 What I know is possible is to create two additional columns in the point layer and use them for plotting coordinates. With lots of points, it can be quite tedious to find the right plotting coordinates for each point. Is there any cleverer way to accomplish that? and use this one as a blocking layer for the labels. Note: The 0.002 is in degrees, because the example image was generated with EPSG 4326. If you use a projected CRS, you should use a larger value appropriate to the units of your CRS. Not the answer you're looking for? Browse other questions tagged qgis polygon labeling vertices or ask your own question. Why are my DMS points plotted way off from their true locations? How to get or assign vertex id to polygon vertices and use these as vertex label using pyqgis? Using marker symbol to point at the polygon instead of the leader line?